Former State Bar president Rodney O. Kittelsen passed away on Sept. 8. He was 90. 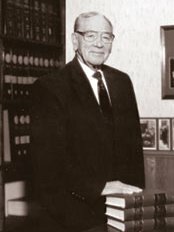 Kittelsen was a partner of the firm he started in Monroe in 1946 with the late Marshal L. Peterson, now Kittelsen, Barry, Ross, Wellington & Thompson. He was a State Bar Senior Lawyers Division board member at the time of his death. Until recently Kittelsen went to the office for several hours a day. "Rod Kittlesen embodied the virtues of a thoughtful counselor, advocate, and active member of both his local and the Wisconsin legal community throughout his long and distinguished career," said former Wisconsin Law Foundation president Cheryl Daniels, Madison. "Attorneys like Rod are not easy to replace and all lawyers can look to him as a model for what our own careers should be." Kittelsen was a lifetime member of the Fellows of the Wisconsin Law Foundation and a former Wisconsin Law Foundation president and board of directors member. In 2005, Kittelsen's generosity helped launch the creation of the Mock Trial Designated Fund, which was established to support the continued success of the program that began 25 years ago during his term as foundation president. DeWitt, Madison. "But the serious efforts required for these services never deterred Rod from partici-pating in more frivolous matters. He was always ready with a good story. He had a great sense of humor and was a boon companion in every respect." Kittelsen was active in the State Bar and in his community for decades. He served as State Bar president from 1976-77 and several terms on the Board of Governors. Kittelsen served on the Pro Bono Committee and as recently as 2005 he was a member of the Unauthorized Practice of Law (UPL) Strategy and Guidance Subcommittee. "Rod's contributions to the State Bar, Green County Bar, and in his community are legendary," said long-time friend Rex Ewald of Monroe. "He was a truly amazing person, and I consider myself privileged to have been his friend and colleague." "Rod was an outstanding lawyer, loved by his clients, and respected by everyone. His sense of humor was legendary," said former State Bar president George K. Steil Sr., Janesville. "I have lost a great friend." A Wisconsin farm boy, Kittelsen graduated from the U.W. Law School in 1939 and practiced law in Milwaukee before becoming a special agent for the Federal Bureau of Investigation, where he worked in the civil rights, treason, and domestic violence areas. During his years with the FBI, Kittelsen supervised several important investigations involving American citizens who broadcast enemy propaganda from Italy, Germany, and the Orient, many of whom were indicted in 1943. Most famous of these was Dr. Ezra Pound, a well-known American poet who turned traitor for Mussolini. Kittelsen served as the Green County district attorney from 1947 to 1953. In 1986, Kittelsen served as legal counsel for X-FBI Inc. in Quantico, Va.
Kittelsen's wife of 65 years, Pearle, passed away in 2005. He leaves three sons, Greg, James, and Bradley.